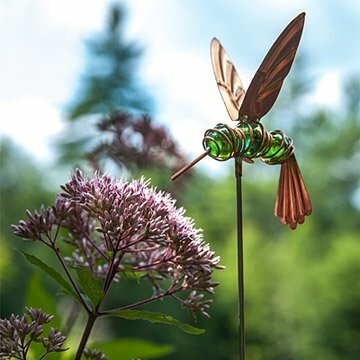 Handcrafted from copper and colored glass, Humphrey the hummingbird is a charming addition to your garden. Handcrafted from gleaming copper and colored glass, Humphrey the hummingbird makes a charming, handcrafted addition to your garden. With petite proportions just like the real thing, he hovers gracefully over your plants and gives your greenery a pretty little pop of personality. Humphrey was made to weather the elements and over time he will develop a gorgeous patina on his copper wings and tail. Handmade by Lisa Fida in Lowell, Maine. Lisa Fida derives inspiration for many of her creations from the natural world, and decided from the outset that she wanted to use materials that would stand up to the rigors of Mother Nature. She personally handcrafts her copper, glass, and cast stone pieces in her workshop, which is located on a sprawling property in the mountains of western Maine. "Copper develops a beautiful patina, glass sparkles in the sunlight, and cast stone provides a natural texture," she says. Read a Q&A with Lisa. Take in during the winter months. Perfect for a garden. Looks beautiful on a cloudy day or when the sun hits it! Knew immediately my folks would like this quirky design. It's really adorable in the garden! My friend is a very talented person with a beautiful yard and garden. This hummingbird made a nice hostess gift and will be a happy addition to her yard. I have him displayed in the midst of my pentas like he's drinking the nectar. I love making up stories about him for my little 2.5 year old daughter. It opens up the doors to an endless imagination as I can see the wonderment in her eyes. My original gift disappeared from the outside of my home. I immediately replaced it with two hummingbirds and for the moment are in a plant inside the house. I love hummingbirds. Very pretty garden accessory. Very petite in size . Would never stand up to the conditions where I live which is why I have it adorning an indoor ficus tree. My sister has this lovely little hummer in her garden. It is sitting in my flowerbed where I have my hummingbird feeder.